The Napoleonic wars of the early 1800s weakened the Spanish Empire, and Spanish territories in the Americas began to claim their independence. On September 16, 1810, the cry of ¡Independencia! for Mexico went up. Eleven years later, Spain acknowledged Mexico’s independence. Texas was initially incorporated as a province of Mexico, but within a year it was combined into a single state with Coahuila, the State of Coahuila y Tejas. In the period of Mexican sovereignty, settlements of Euro-American people led by empresarios were established in the state of Coahuila and Texas. Empresarios means “businessmen”; we might say “developers” today. The closest development to the Dallas area was about 90 miles to the south and it was not settled until the 1830s. Those who settled in empresario grants settled legally, but illegal Anglo aliens also crossed into Texas, and some of these came close to the Dallas area. Late in the period of Mexican Texas there were settlements of English-speaking people without empresario contracts about 90 miles north of the Dallas area along the Red River, and a tiny settlement within the Robertson empresario colony about 90 miles south of the Dallas area at the headwaters of the Navasota River. Non-empresario immigrants to Coahuila and Texas tended to settle near its borders with the United States, along the Sabine River in East Texas or along the Red River to the north. A few settled on the Red River north of where Dallas is today. Shallow-draft boats could navigate the Red River in certain seasons with the labor of removing debris along the way. In 1833, an American named Holland Coffee navigated up the river from Arkansas and found a site for a trading post he established in the next year. Coffee’s Station was on a ford of the Red River that is now submerged under Lake Texoma. He settled on the Texas side of the river and Mexican authorities repeatedly attempted to remove him, leading Coffee to move his trading post up and down the river. But he never abandoned it. 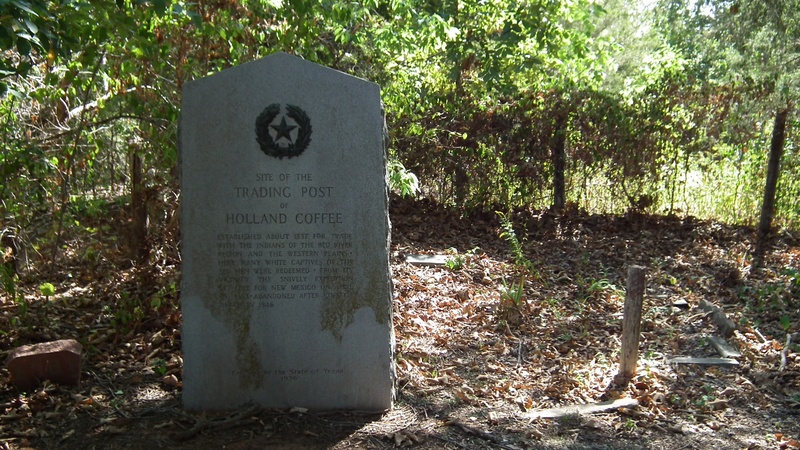 Historical marker near site of Holland Coffee’s trading post, Lake Texoma. 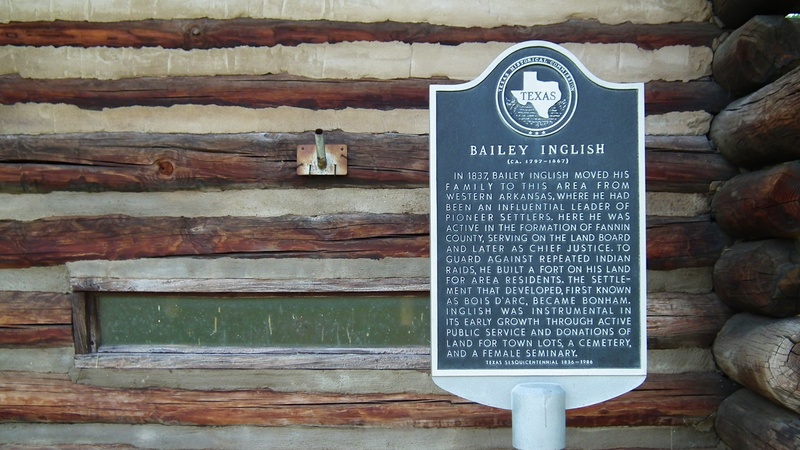 In 1837 another American, Bailey Inglish, established a settlement and built a stockade fort downstream from Holland and a few miles inland on the site that is now the city of Bonham, Texas. Both Holland’s and Inglish’s settlements remained into the period when Texas became a republic, and they would provide a delicate, initial infrastructure for settlers moving south into Texas and the area that would be Dallas. Another group of settlers penetrated much deeper inland and settled about 90 miles south of present-day Dallas. In 1833, the same year as Holland Coffee found his site on the Red River, a congregation of predestinarian Baptists from Illinois led by Elder John Parker entered the state of Coahuila and Texas. They settled at the headwaters of the Navasota River in 1834 within the bounds of the Robertson empresario colony. 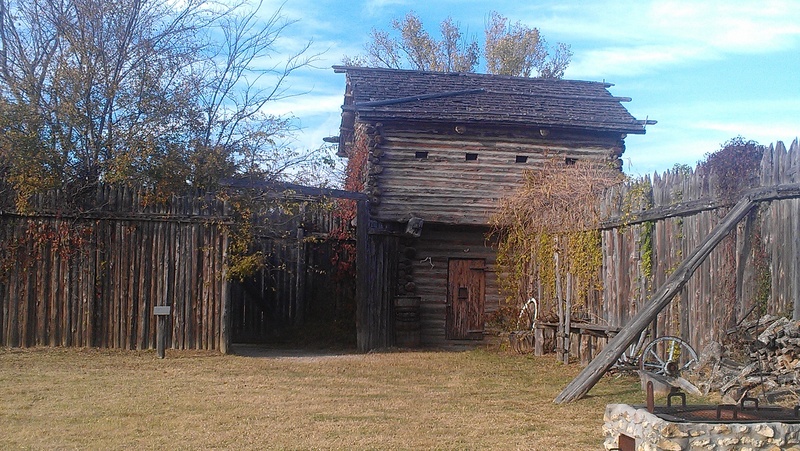 Despite the Elder’s experience with other Native American groups, and despite the fact that the settlers built a stockade fort on the site, the Parker settlement was attacked on May 19, 1836, by a raiding party including Comanche and other prairie people. Five men including John Parker were brutally killed and five children were taken captive, including his granddaughter Cynthia Ann Parker. Rebuilt (replica?) Fort Parker, near Groesbeck, Texas. Cynthia Ann Parker would live for twenty-five years with the Comanche and she married a chief, Peta Nocona. Their son Quanah Parker would be the last war chief of the Comanche. He fought fiercely for his people’s independence early on, but eventually brokered a deal with the United States government that brought the Comanche to a reservation in Oklahoma. One day he would be treated like a rock star at the Texas State Fair in Dallas. That was still far in the future in 1836 when the Parker massacre occurred. The site that would be Dallas was still a grassy knoll by a ford of the river. But things were changing. The Red River settlements of Coffee and Inglish were encouraging pioneer settlers, and just five days before the Fort Parker massacre, Mexican President Antonio López de Santa Anna had been forced to sign the Treaty of Velasco acknowledging the independence of the Republic of Texas.